I picked Winger up at the library after hearing positive things about it on Goodreads. I didn’t know what it was about or what to expect but I ended up really enjoying Winger! It was something different and I found the voice of Ryan Dean West to be one of the most honest in any of the YA novels I’ve read this year. Ryan Dean West was witty, sharp, funny, and completely relatable. I loved watching the transformation he goes through throughout this novel. In the beginning he was worried, and constantly calling himself a loser. By the end of the novel the Ryan Dean West we met in the beginning is nearly non-recognizable he becomes a fearless, go go-getter, but he still calls himself a loser which makes him all the more relatable. One of my favorite aspects of this novel, which really set it apart, was the drawings that were included with the story. They were little doodles like graphs, or comics, and all of them were funny and added to the atmosphere. My one qualm was that this book actually felt like two different books. I liked West and his transformation but the end of the book was very emotional and heavy. While there was a bunch of foreshadowing, so much that you knew what was going to happen, it still felt like the ending came out of left field and didn’t match the rest of the story. Overall, I enjoyed Winger. All of the character’s voices were so honest that it made me love just reading about West and his friend’s day-to-day lives. 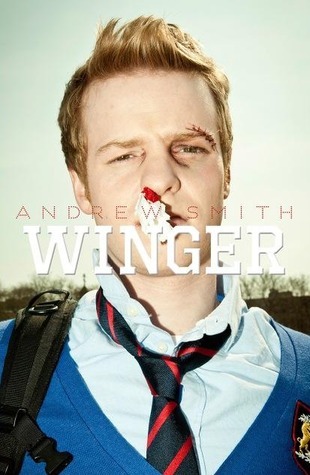 I look forward to reading more novels by Andrew Smith and the sequel to Winger which I hear is coming out in 2015!